The spoon and the bowl are the earliest known dining implements, and the plate came along much later. Initially, it was a hunk of stale bread, about 6 inches across and hard enough to hold hot food. Since it was cut from a loaf, it had rounded edges, and when earthenware plates started to be made, the pottery-makers emulated that shape by making the plates round. The Chinese discovered the process of making porcelain around 600 A.D. They had a plentiful supply of the major ingredient – kaolin clay – and they developed the kiln techniques and glazing processes required to create translucent, hard-paste porcelain. When trade routes opened to China in the 1300’s, porcelain objects, including dinner plates, became a must-have for European nobility. However, it wasn’t until 1708 when a German potter in Meissen discovered the Chinese process, that the great European potteries came into being. Many of the world’s best known potteries were founded during this period – Royal Saxon (the original producer) in 1710, Wedgwood in 1759, Royal Copenhagen in 1775, and Spode, founded in 1776 in England. Monarchs and royalty continued their traditional practice of collecting and displaying porcelain plates, now made locally, but porcelain was still beyond the means of the average citizen. In the 19th century, improved production techniques made porcelain more affordable. From 1815 to 1898, 17 new manufacturers started their companies in Europe and the United States. Among them: Bing & Grondahl, Haviland, Bareuther, Goebel, Heinrich, Kaiser, Rosenthal, Belleek, Royal Doulton, Gorham, Edwin M. Knowles and Lenox.The practice of collecting “souvenir” plates became popular in the late 1800’s. These featured transfer designs commemorating special events or picturesque locales – mainly in blue and white. It was an inexpensive hobby, and the variety of shapes and designs catered to a wide spectrum of collectors. The first limited edition collector’s plate ‘Behind the Frozen Window’ is credited to the Danish company Bing and Grondahl in 1895. 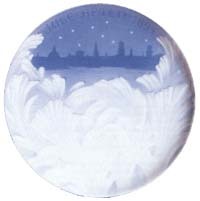 Christmas plates became very popular with many European companies producing them most notably Royal Copenhagen in 1910, and the famous Rosenthal series which began in 1910. In the mid-1900’s, European collector’s plates arrived in the US. There was immediate interest form gift shops and department stores and the from the public. The growth of plate collecting and the number of companies producing them is very much down to the strength of interest in the US. In 1965 Lalique introduced a lead-crystal art plate – this was the first plate introudced to the US market which was not blue and white, not procelain and not for Christmas. Since this time collector’s plates have come in many different shapes, forms, colours and sizes. 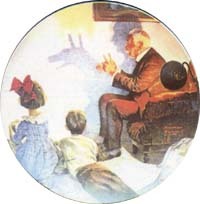 Plate manufacturers also started licensing the artwork of well-known artists, such as Norman Rockwell, to create new lines. In 1973 The Bradford Exchange was founded by J. Roderick MacArthur. The company helped organise the collector’s market and they even opened a trading floor for the buying and selling of collector’s plates. Many new editions still sell out and there is continued interest in th early plates from the European porcelain manufacturers. It seems that the Western fascination with plate-collecting has continued unabated for centuries and will undoubtedly carry on into the new millennium.